Collingwood’s 2019 AFLW best and fairest winner, Jaimee Lambert, heads a further list of five players to have signed fresh deals with the club. The ink on Lambert’s signature dried shortly after 2018 Rising Star Chloe Molloy, foundation defender Stacey Livingstone and 2018 draftees Lauren Butler and Mikala Cann put pen to paper. The news follows the re-signing of seven players on Tuesday. Three days in to the AFLW sign and trade period Collingwood has secured 12 of its squad for 2020 and, at this point, retained nine of the top 10 placegetters in this season’s best and fairest count. Playing a full 2019 AFLW season, Lambert enjoyed the season of her career as a leader and mid-field force. The 26-year-old shapes to be an on-field general for years to come. Molloy was restricted to the sidelines in 2019 due to a Lisfranc foot injury but the 20-year-old 2018 All-Australian and best and fairest winner will play VFLW this winter in preparation for the 2020 AFLW campaign. 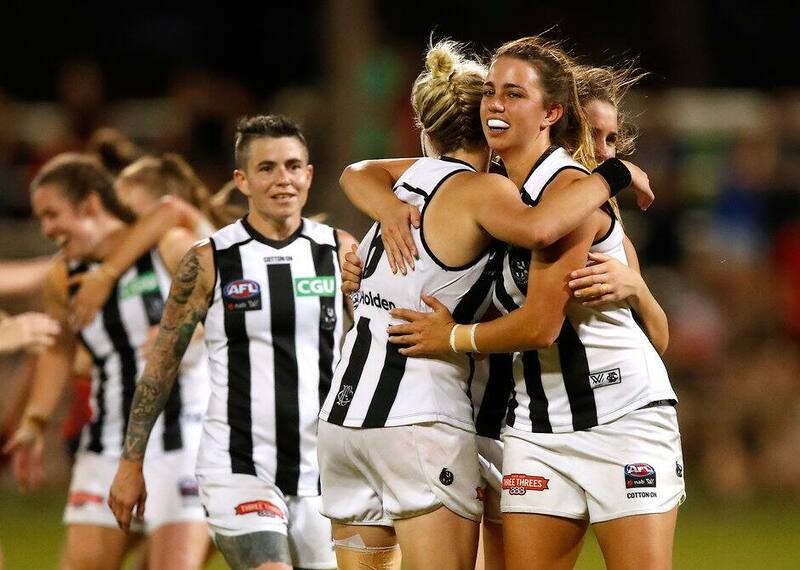 When expansion of the AFLW competition loomed, Collingwood opted to invest in the draft and build a critical mass of high-end young talent. Butler and Cann are therefore important players in the club’s long term strategy. GM of women’s sport, Jane Woodlands-Thompson, is delighted with the swift commitment from so many of Collingwood’s signings. “Securing 12 of our last years’ list validates that our women’s football program is solid and working,” Woodlands-Thompson said. “Our strategy was always long term and we’re thrilled to see our draftees re-signed for another year.